Wrote a new plugin for WordPress and not to deprive Blogger-bloggers, imagine the same thing for Blogger, developed on the basis of my jQuery plug-in Simple Counters. 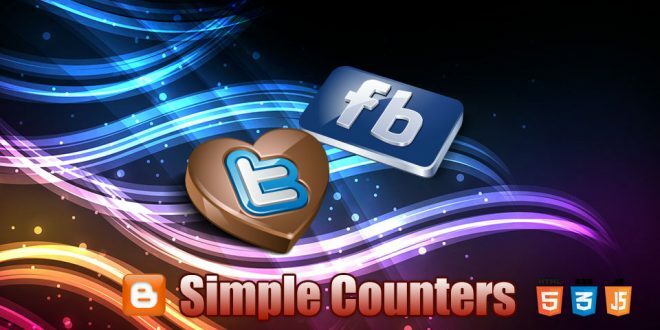 So, Simple Counters for Blogger-blog. The plugin is designed as a badge-informer. Ticker displays the number of subscribers to FeedBurner and followers on Twitter. The plugin is fully customizable. Using custom plug-in parameters can customize the color of font, color and vector direction of the gradient background color and/or theme tips, icons for FeedBurner and Twitter, both for the badge, and for the tips, positioning badge on the browser screen, etc. Working example of a plug-in can be found on my test Blogger-blog. Deprecated! Feedburner Awareness API is dead! Share this plugin files on the hosting, which you use to store files for your Blogger-blog, for example, on FileAve. position – right or left, output badge on the right or left of the browser window. delta – the numeric value in pixels. Negative value – offsets badge up from the middle line of the browser screen, positive – offsets down to specified number of pixels. dgv – the direction of the gradient background. horizontal – from left to right, vertical -from top to bottom. color – the starting color of background gradient. Six hexadecimal digits (‘#1c82d0’). colorTo – the final color of background gradient. Six hexadecimal digits (‘#145181’). borderColor – translucent color (40%) of badge edges. Six hexadecimal digits (‘#676767’). hintImg – image URL for FeedBurner tip. 40×40 pixels, transparent background, PNG. hintImg – image URL for Twitter tip. 40×40 pixels, transparent background, PNG. Attention! In contrast to the WordPress plugin, Blogger plugin does not cache query results and displays the current values. This means that once a day, during the conversion values by FeedBurner, will be given zero value! © 2010 – 2018, minimus. All rights reserved.